Mae Jampaa's story: Mae Jampaa, meaning Magnolia, was rescued in December 2009. Before she arrived at the sanctuary of ENP, she was worked in the Logging industry until 1989. After the Logging industry was banned she was put to work in the Trekking industry. Mae Jampaa is the best friend of disabled Mae Mintra and is a protector. It's no wonder then, that Mae Jampaa became the number one Nanny of Mintra's young calf, Yindee. Yindee's story: Yindee, meaning Pleasure, was lucky enough to be born at Elephant Nature Park in August 2013. Being born at the ENP means Yindee will never have to go through the awful violent process of 'breaking the spirit' otherwise known as Phajaan. He will never have to work or entertain tourists. Yindee lives within a family unit under the protection of his mother and nannies. Yindee is friends with the mischevious youngster, also born at ENP, Navann. When it's hot they meet each other at the river and do not hesitate to play. They are free to chase, push and play like the youngsters they are thanks to Elephant Nature Park. The A3 original artwork of Jampaa & Yindee is currently for sale via The David Shepherd Wildlife Artist of the Year Exhibition and online. High quality prints are now available. Size A3. 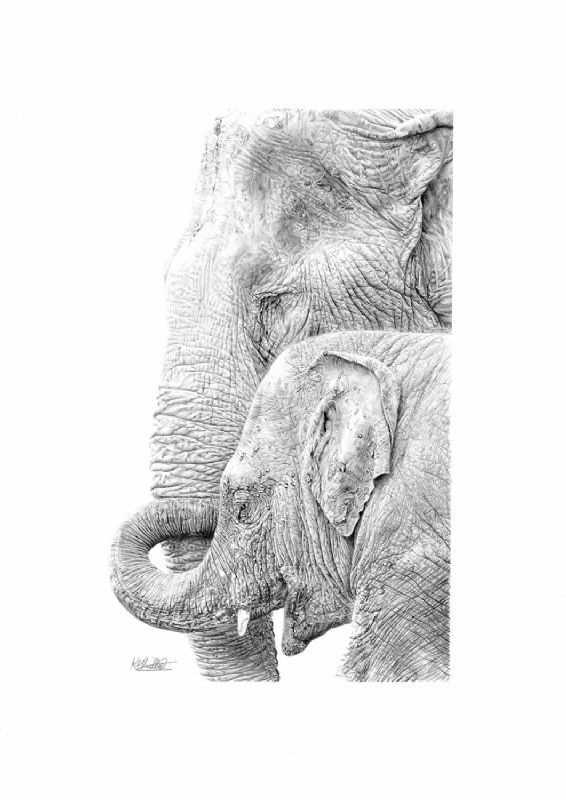 50% of profits will be donated to Elephant Nature Park.